Especially when you are eating at restaurants, it can be difficult to know where your food comes from, and we believe that where your food comes from matters. When you add in factors like unfamiliar cultures and languages you don’t understand, finding out if your food is real or not becomes a much more challenging task. But just because something is difficult doesn’t mean we shouldn’t do it. We are making it our mission to prioritize eating real, no matter where we are in the world, and to tell you what we find so that we can all support the places, people and products that help you to be mindful of what you eat. It’s that simple. 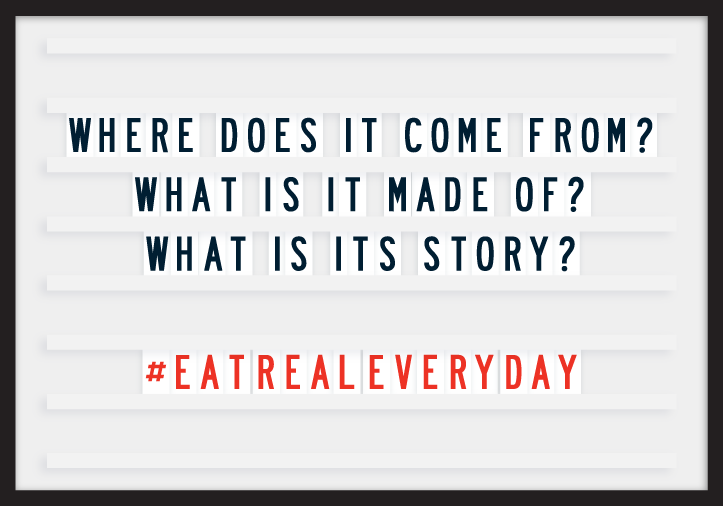 We aren’t saying that you can only eat something if you know and like the answers to all of these questions; our #EatRealEveryDay initiative doesn’t prohibit you from eating anything, but it does ask you to make an effort to eat something real EVERY day. What you determine is real food is up to you. The goal is to stand up for real food and, as a result, for ourselves, our health, our planet and for the people who work hard to bring us food that’s worth eating. What Does Real Food Mean to Us? We believe that real food is made with natural ingredients and that it respects the traditions of slow cooking. Real food can be practical, it can be convenient, and eating real doesn’t necessarily require that you cook anything. Real food cares about the principles of sustainability. Eating real is about getting to know your food and how it was made. Real food doesn’t have to be made exclusively with local ingredients, but it should help support the local community. The replacement of real food by food-products that have been manufactured with cheap substitute ingredients using processes that we don’t understand is a huge problem that we face in contemporary society. The tides may be turning on Big Food, but we believe their objectives to maximize profit while minimizing expenses remain the same. We support companies, no matter their size, that produce food in a healthy and ethical way. Big Food knows that trends are shifting towards real food and there are companies that are undoubtedly making positive change, but it’s important to recognize that there are as many that have just turned to clever marketing of purported natural foods to make you believe that eating what they sell is healthy. Food problems in the world are many, from famine and food-related disease to food waste and childhood obesity. These are problems that eating real alone has little chance of solving, but eating real is a simple change that you can make in your own life that will help alleviate some of the problems our food system is facing. 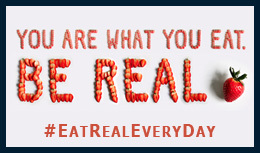 That is why we are pledging to #EatRealEveryDay. It’s our responsibility to be aware of what we eat, the information is out there, and it’s time to do something. The sale of pre-made foods is by no means the enemy – but there is a difference between those that are made with whole ingredients and those that employ so many modified, artificially produced and ultra-refined ingredients that it becomes impossible to understand what you are eating. If you want to support real food, ask yourself Where does it come from?, What is it made of? and What is its story? every time you make the choice to eat something. You don’t have to always eat real, but by always questioning if your food is real, we think you’ll inevitably find yourself changing the way you eat. 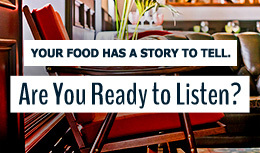 For our part, we’re starting by organizing events that help you reconnect with the food you eat, we’ll be working with prominent names in the food industry to advocate for eating real every day and we’re taking to Instagram, Twitter and Facebook to share our real food journey. 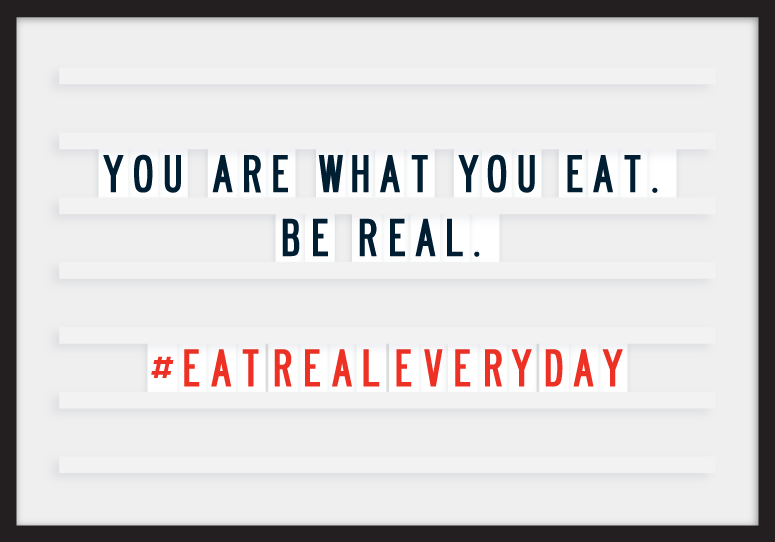 We understand that changing habits is never easy, but if you care about real food, join us and share what you are doing to #EatRealEveryDay!